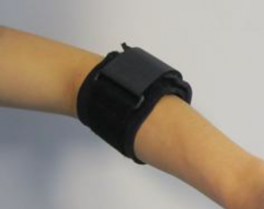 Counterforce braces are often used for pain relief in LET. They are thought to diffuse the load through the tendon to less sensitive areas, thereby decreasing the stress on the area of pathology. A combined cadaveric and clinical study showed a 13-15% force reduction of the ECRB origin with the counterforce brace (Meyer et al 2003). 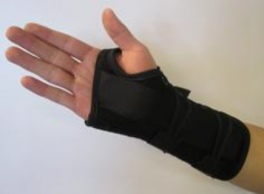 Wrist splints are less commonly used, but do have some support for temporary pain relief in more acute patients. The goal is to rest the musculotendinous unit originating at the lateral epicondyle. This taping technique consists of four tape strips, repeated twice. 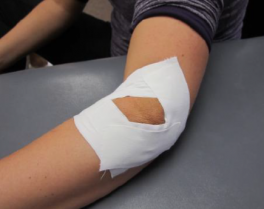 The tape is laid in a diamond shape while pulling the soft tissues centrally towards the lateral epicondyle. The goal is to decrease tension at the epicondyle attachment. ↑ Meyer NJ, Walter F, Haines B, Orton D, Daley RA. Modeled evidence of force reduction at the extensor carpi radialis brevis origin with the forearm support band. J Hand Surg [Am] 2003; 28:279-87.